Okay, that's an exaggeration. Anyway. I rediscovered these notebooks crammed in between books on my shelves last night. 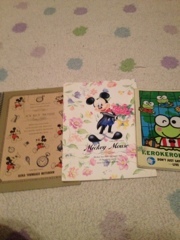 They are fairly thin notebooks, from a relative or family friend who came to visit from Japan, bearing gifts for the whole family. 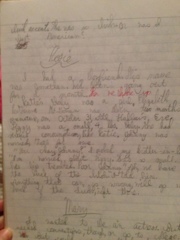 I, like many a budding writer in the days before laptops, coveted notebooks. My parents soon learned that bringing me along to Staples was an expensive venture, because I wanted pens and notebooks the way most kids want video games and ice cream. Circa 1999, I wrote my first "novel" in the pages of these notebooks. I don't know what the official page count was. Truth is, I don't remember what it was about. But I remember staying up past bed time in my room, sitting on my bed, pencil and notebook in hand and continuing the story on from whatever point I'd left it the night before. I'd write it by lamplight, no outline, a total pantser. I think it's about a dysfunctional family and a girl with a boy for a best friend? 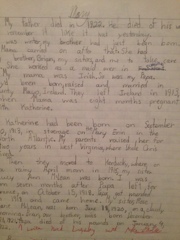 I don't remember, but this was post-6th grade, story-a-week "I want to be a writer" time and pre-fanfiction writing. Can we call it part of my "Juvenilia?" As you can see, it was completely handwritten. 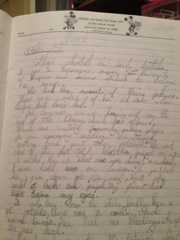 I wrote several stories by hand as a teenager. That's how we'd done it in elementary school--handwritten drafts, typed final copy--and I carried that over to the writing I did at home, too. Plus, I didn't get my very own computer--a hand-me-down laptop--until high school. Until then, there was a computer in the house, but it was not in my room, which was not conducive to story writing, as far as I was concerned, because my parents would be telling me that it was time for bed. That's the first page of the notebook labeled #1. As you can see, I was attempting to write it in my neatest handwriting. For whatever reason, it's written in pencil. On some pages, it looks like I just dashed down ideas, crossing words out when I didn't like something. I think the red-penned bits are stuff I added later or my "revision marks." Still later, the handwriting devolved into script. I won't even attempt to try to decipher that; my cursive, at the best of times, is horrific. In some places, the pencil has faded. I wonder if I used the same pencil through the whole thing or multiple ones? I have multiple narrators in this one. I've only read the first page. It was written in first-person. I don't think I started writing more consistently in third-person until I was a little older. Whenever I changed narrators (and therefore, POVs), the character's name was written at the top of the section. Re-reading or finding the stories I wrote when I was a kid sometimes make me cringe, sometimes make me giggle. Sometimes I'm impressed. My childhood best friend showed me a story I wrote in 6th grade about the Titanic which she had in her possession. It was 5 pages long, typed, and though my grammar left a lot to be desired (and I didn't indent with new characters' dialogue), I had somehow absorbed the importance of page breaks when changing scenes. I'm still the kid writing stories at night, letting my imagination go, deciding how to tell this particular story, and having fun while doing it.